Portland is a little weird. I know that goes without saying but to think that this billboard would be controversial considering the season…. H/T to both Happy Catholic and The Curt Jester. Now, this happens to also be a time where a new abortion mill is going up a handful of blocks from my parish (where the sign originally was) and just to our north Washington State voted last month on assisted suicide. So I can see where there can be some “politics” viewed there. But this is first and foremost a religious statement. The fact that the incarnation can be viewed politically at all is simply evidence of how entrenched and hostile the culture of death is. When a pregnant Mary, full of life, is seen as a statement against the political status quo the political status quo is pretty dismal. I suspect an ultrasound image of a baby in utero would have been viewed similarly. 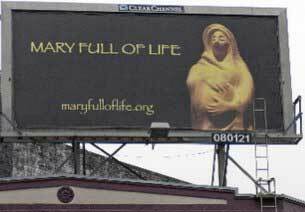 “Images of an obviously pregnant Mary are rare, said Jane Kristof, professor emeritus of art history at Portland State University. The Virgin round with child is a standard in medieval and renaissance art. Pregnancy in the plague years especially was viewed as highly beautiful. Do quick search on the Madonna of the good milk or the Virgin Mother and you will have more images of breast feeding and pregnant Marys than you can shake a stick at. Now maybe Ms Kristof is talking about modern art… or maybe she is stuck in some weird alternate universe that hates pregnant woman… but I am not seeing the undignified thing she is thinking she sees. But then again this IS Portland we are talking about and as the oft seen bumper stickers reminds us — we keep it weird. You are currently reading Portland is a little weird. at Simply Catholic.